LONDON--(BUSINESS WIRE)--The global waterjet robots market is expected to grow at a CAGR of close to 7% during the period 2018-2022, according to a new market research study by Technavio. The report presents a comprehensive research of the global waterjet robots market by application (cutting and cleaning) and by end-user (automotive sector, metals and machinery sector, and aerospace and defense sector). The report also determines the geographic breakdown of the market in terms of detailed analysis and impact, which includes key geographies such as APAC, the Americas, and EMEA. There has been an increasing emphasis on product quality by end-users, which has led to an increase in the adoption of waterjet cutting to capitalize on the advantages provided by the method. In contrast with plasma cutting and laser cutting that are popular and widely adopted methods of cutting, waterjet cutting does not require any additional costs. Plasma and laser cutting cause hardening and wear and tear, therefore additional costs are associated with machining that is required because of this. Virtual commissioning is gaining traction over on-site commissioning because it assists in the reduction of time and cost by 50%-60%. Virtual commissioning supports the entire lifecycle of waterjet robots, apart from the initial design and decision-making processes. Waterjet cutting and cleaning is a complex and repetitive process, which requires highly skilled personnel. The process involves the production of high volume parts. Thus, it requires an in-house programming expert for application settings in waterjet robots. SMEs are unable to compete with the large enterprises because of the shortage of skilled programmers. Most of the production staff lack proper knowledge of robotics programming that slows down the growth. Big savings with Technavio this February! Get 20% OFF on all Education Technology reports. This offer is valid only till the 28th of this month. Celebrate winter sports with 23% OFF on all reports in the Outdoor Gear library (Offer valid from Feb 9-25). 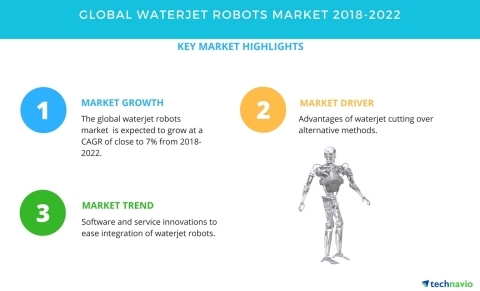 The global waterjet robots market is expected to grow at a CAGR of close to 7% during the period 2018-2022, according to Technavio.